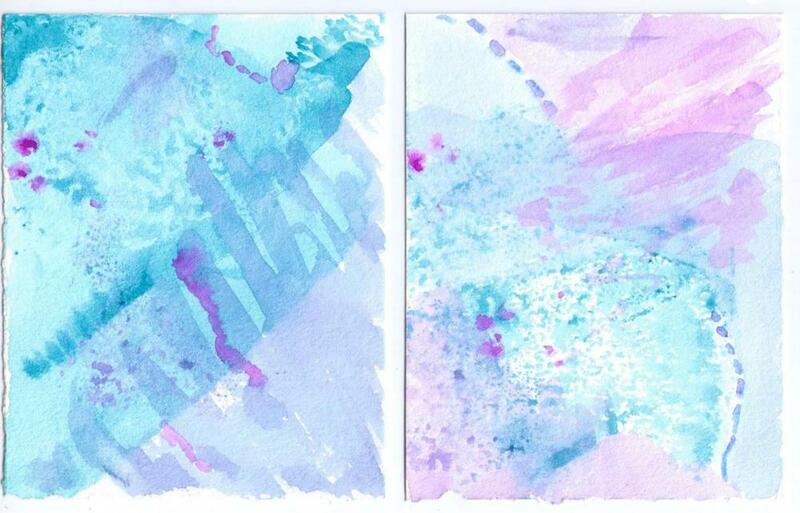 I painted these two small watercolors as part of a short series. I was in the middle of a different project at the time, very much inspired by the new life growing within me, Halia's brother (A., now 2 years old). The differences between Halia and A. were so evident to me then, even before I could feel him kicking or learned his gender. To me, he was red, ruby red, and I was awash in deep red paper in his honor. Suddenly, I needed to spend time with my memories of Halia. It took a little while for me to settle in to remembering, and as I did, a peacefulness came over me. That same feeling returned yesterday as I wrote the post about the Blue Portrait. Throughout the day today, that feeling has continued to washed over me -- a real sense of comfort and joy in being able to remember her and to connect again to my sense of who she was/is. Then, too, come the waves of sadness, of disbelief, of regret. And, as both kinds of waves recede, I am left with gratitude: thankful for the courage that spurred me to move past my fear and be willing to be here with my memories and my grief, thankful for those of you acting as my witnesses by reading and encouraging me, and most of all, thankful for love that knows no boundaries.